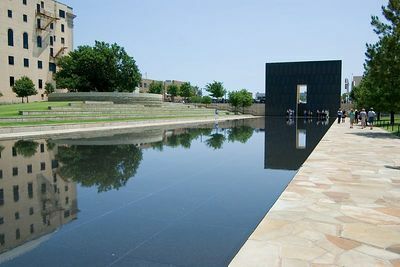 "The Oklahoma National Memorial honors the victims, survivors, rescuers and all who were changed forever on April 19, 1995." 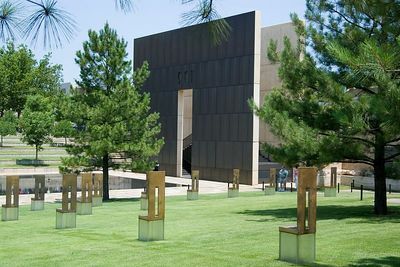 It is on the site of the Murrah Federal Building that was destroyed on that day. 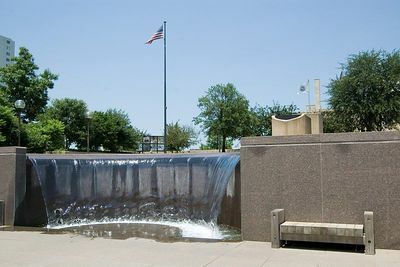 Murrah plaza. Part of the original design of the fedral building. This area, including the flagpole, remained relatively intact.Click on any image for a larger view. Logos of the 19 agencies that occupied the building are engraved in the plaza tiles. 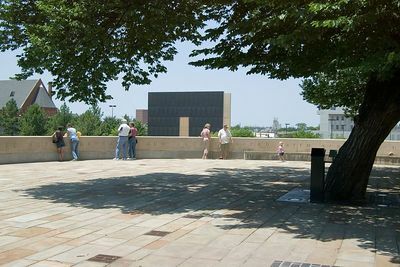 The plaza now provides an overlook of the memorial area. 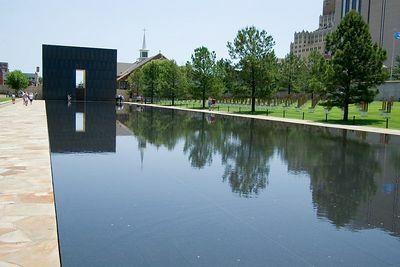 Seen here are The 9:03 Gate, The Field of Empty Chairs, The Reflecting Pool, The Rescuers' Orchard and The Journal Record building. 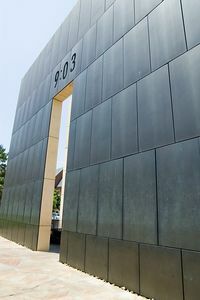 The Gates of Time stand at each end of the of the memorial, framing the moment of destruction - 9:02. The West gate is marked 9:03. The East gate is marked 9:01. 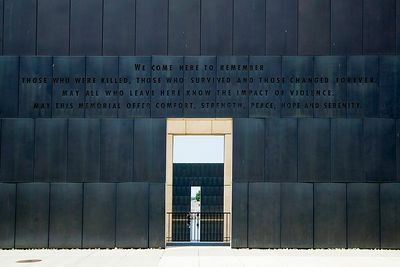 The inscription: "We come here to remember those who were killed, those who survived and those changed forever. May all that leave here know the impact of violence. 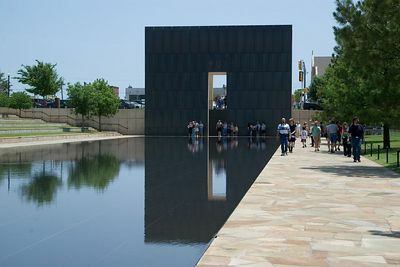 May this memorial offer comfort, strength, peace, hope and serenity." 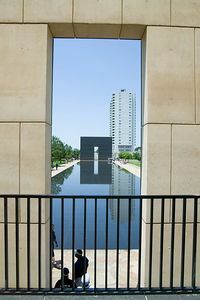 The 9:03 Gate and The Reflecting Pool, framed by the 9:01 Gate. 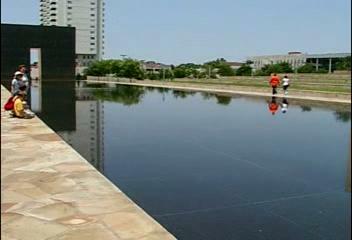 The Reflecting Pool occupies what was once N.W. Fifth Street. The shallow pool of gently flowing water is intended to soothe and calm, providing a peaceful setting for quiet thoughts. 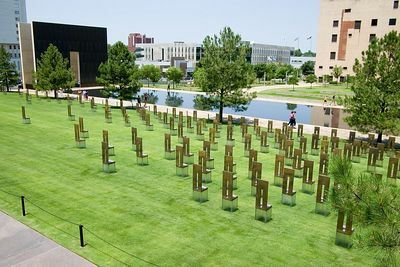 The Field of Empty Chairs symbolizes the absence felt by family members and friends of those lost. 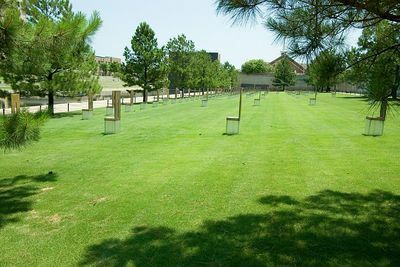 The field's perimeter matches the footprint of the former Murrah Federal Building. 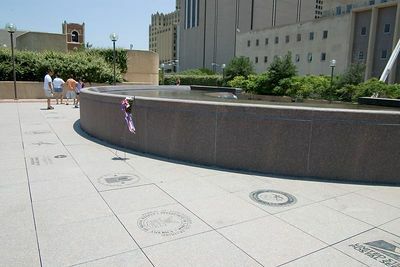 It is lined by a granite path. 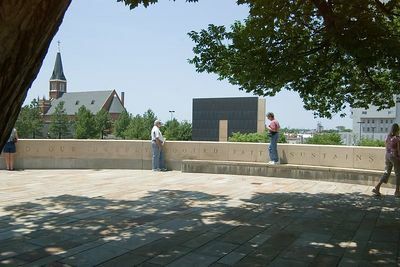 The granite was salvaged from the Marrah Plaza. 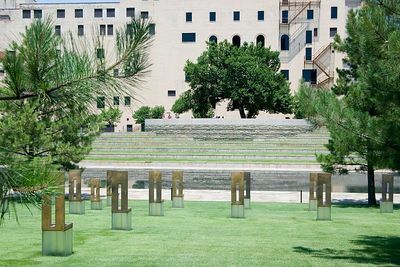 The 168 chairs are arranged in nine rows, representing the nine floors of the building . 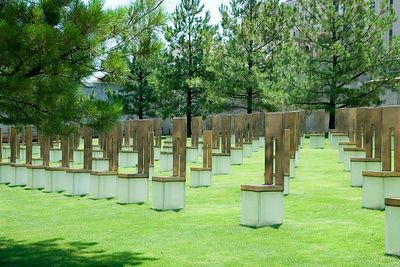 The chairs are placed according to the floor on which those killed worked or were visiting. 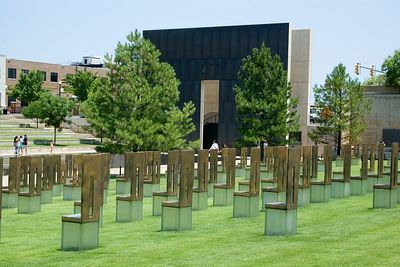 The glass base of each bronze and stone chair is etched with the name of a victim. The chairs are in two sizes. The nineteen smaller chairs represent children. The playground of the children's day care center that was located in the federal building. 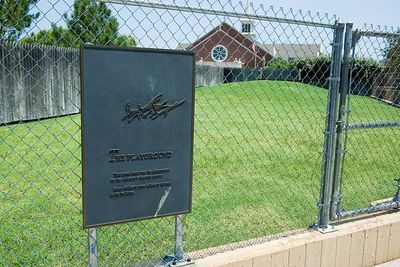 The Children's Area - After the bombing countless expressions of encouragement were sent to Oklahoma City by children. The tile in the foreground is part of a wall of hand-painted tiles sent to Oklahoma City in 1995 by children. 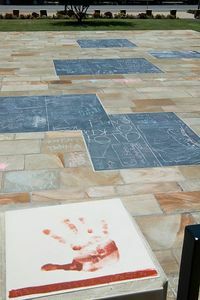 A series of chalkboards and flagstone provides a place where children can tontinue to share their feelings. 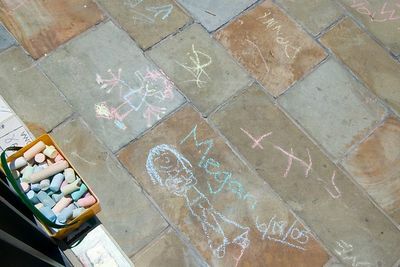 Baskets of chalk are provided for use by visitors. 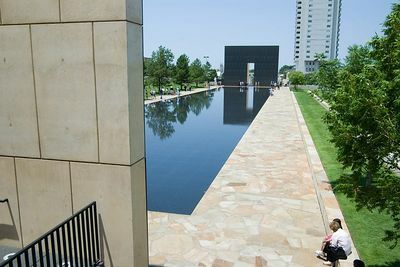 (Video) The 9:03 Gate, The Rescuers' Orchard, The Survivor Tree and The 9:01 Gate. 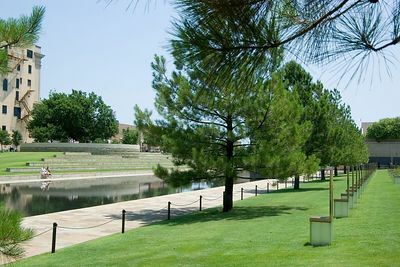 The Survivor Tree, a 90 year-old American Elm, stands as a symbol of human resilence. The inscription on the wall surrounding the tree, facing The Rescuers' Orchard reads, "To the courageous and caring who responded from near and far, we offer our eternal gratitude." 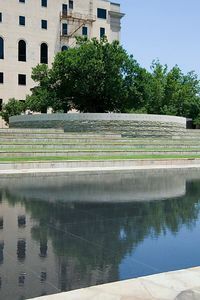 The circular promomtory surrounding the tree offers a place for viewing the Memorial. 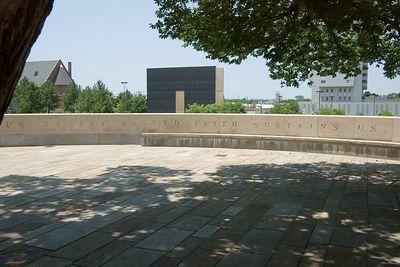 The message to visitors, inscribed on the inside of the wall reads, "The spirit of this city and this nation will not be defeated; our deeply rooted faith sustains us." Photos Copyright George Sinos 2003-2014. All Rights Reserved.